On Monday we looked at the German translation of a piece by John Elfreth Watkins, Jr. for the December 1900 issue of Ladies Home Journal. Today we have the English version which highlights the coming advances of the twentieth century. Below the full text is provided but we'll be examining it further over the next few weeks. Excerpts from the article below can also be found in the book Yesterday's Future: The Twentieth Century Begins. Surprisingly, this is fairly accurate. It mentions some useful modern technologies, like what we would call MRI, television, tractors, and take-out meals. In some cases, it's was overly pessimistic, like the average life expectancy being only 50 years old. On the other hand, we still don't have cold-tolerant orange trees. How very optimistic...and peaceful! They didn't see the aero-plane coming, but then they also didn't see a century of war and devastation ahead. Not bad for Ladies Home Journal, either - you'd expect this kind of stuff from Modern Mechanix, Great Wonder Stories, Tales of Tomorrow, and the like. "Oranges in Philadelphia." My word. It is fairly accurate indeed. I specially like the part where music would go thought the tubes to theaters across the world, paid by philanthropists..
And thank good wild animals, horses or mosquitoes were not extinct!.. A lot of species became extinct very well, but I the optimistic way the article expects it is really disturbing. I'm not sure where they got their lifespan data. According to this report (page 79) the life expectancy in 1900 in the US was already in the 50s. Maybe they were speaking globally? But were global statistics even available then? Actually did you even look at that chart, because it says 40s not 50s. Yeah, Mr. Watkins seems remarkably accurate in his predictions. I give him 104 True, 56 False, and 11 Unknown, for a "rate the futurist" score of 66%. sad how our sense of social justice (note the prediction of free higher education for all, including free clothing and lodging for the poor) has pretty much dried up and blown away in this country. Thanks a lot, WWII, TV, Suburbia, and the war on terra! people seemed so excited and optimistic about the future in 1900, now we are just terrified. nobody speculates today what the world will be like in 2100 because i think we are very pessimistic about it. we wonder... will our cities be underwater, our wildlife extinct, our soil and water completely corrupted, our governments toppled, our resources tapped, our cultures melted into one giant megacorporation? also the rate of change is increasing, so our speculations about 2020 are sometimes as far out as 100 years would have been 100 years ago (if that makes sense). Read "the city of tomorrow" by le corbusier, its equally fascinating. interesting how a culture's values are reflected by its predictions for the future. that's funny. Many were at least somewhat on target, except for those involving prices and economics (inflation not being understood or believed by these particular people, I suppose). Again, electricity is a cure-all, pneumatics are considered to be the future, etc. but still many are fairly accurate. A word on lifespan: they correctly predicted that we'd be able to stay healthy longer, but failed to predict the precipitous decline in infant and child mortality which in earlier centuries dragged the expectancy down so far... that's intriguing. I'm sure they would be amazed that the world turned out so much better then they predicted. No we didn’t wipe out bugs and rats, but we did get welfare, even greater life expectancy and health. They never even hinted at the technology we have (to England in 2 days? We used to have it in 2 hours), they did expect the new war craft, etc. Like us they thought their fuel (coal) would run out, and “renewable resources” would take over. I’m sure our presses speculation about nations submerged by global warming, and wind mill powered cities will seem far less prosaic in 2100. Hell Star Treks predictions for 300 years in the future seem to have mainly come true- or be a lot closer then suggested. These predictions are very good on the whole. It's interesting how some of them say more about the predictor than about the future - e.g., strawberries as big as an apple, right on the button! But neither Mr Watkins nor the 21st-c. supermarket consumer asks why we need gigantic strawberries, or whether they have any taste (they don't). As for the idea of arresting shopkeepers who sell food exposed to air, it expresses the trend of demanding angelic purity in edibles which continues to this day. Fortunately it is not always victorious. In Canada in recent years authorities have tried to outlaw the hanging of dried sausages on hooks, but people rebelled. strange how they only went to men to get their predictions, as if a woman was not capable of anything as difficult as projecting her mind into the future. there is not so much as a whiff of feminism in the air, and none of the male 'experts' anticipated female emancipation either. It has a very Teddy Roosevelt world view. It might have even been written by him judging from the item about the letters being banished. Teddy was very much for that. Probably because he was a horrible speller. Overall, very good prognostication! "Oranges will Grow in Philadelphia"
Maybe they were predicting global warming. Kellyst - "I'm sure they would be amazed that the world turned out so much better then they predicted." Not so sure about that - we didn't learn to exterminate bugs and rats but we did try to exterminate whole groups of people. I'd say the hundred years following the prediction were much worse than anyone would have predicted. What's even more interesting than reading an old forecast, is reading the reactions from everyone today. Clearly, pessimism and optimism still wage war to this day. Peas as big as beets? That's not a world I want to live in. Could you please clarify the origins of your source material? 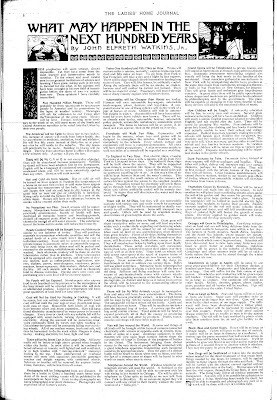 For an article purported to be from the 1900s, the scan displays typography and typesetting resembling a modern word processor rather than a 19th century linotype machine. Could this be a hoax or just an article that has been redesigned for a modern book? It's a microfilm scan from the University of Wisconsin-Milwaukee. I'm sure if Milwaukee has it, you can find it at most major universities. I'm the anonymous way up there on April 20... just posting to correct a stupid typo. It should be "the life expectancy in 1900 in the US was already almost in the 50s." It still seems very odd that Watkins claimed people only lived to 35 and that they will live to 50 in the future. They were already living, on average, to nearly 50 years. I can vouch for the fact this is an actual article because I collect antique Ladies Home Journal magazines and found it on page 8 in the December 1900 issue! (Sometimes reading old documents such as this is the closest thing we can get to time travel! Actually, the strawberry apples thing is probably accurate. Apples have grown in size as well, and I strongly suspect that the larger strawberries from today would compare favorably to apples from then. Will - "I'd say the hundred years following the prediction were much worse than anyone would have predicted." Don't be an idiot use your head. If we eliminated all of the bugs this world then how many other animals would be killed because of that. We may have not eliminated rats but at least they don't pose threats to us anymore. When is the last time you heard of someone getting sick from a rat? We may have had a lot of death from wars in the first half of the century but after that the world rate of people dying in wars dropped dramatically. I am sure that they would love the fact that our worst war in recent history the vietnam war only 58,000 were KIA and in the Iraq war it's down to less than 5000 for 5 years! Think about whether they could say that next time you think the time period you grew up in was so much worse than 100 years ago. Sick from a rat? Salmonella, anyone. Not to mention Hantavirus, bubonic plague, and typhus. All I can say is, "Rats off to ya!" You've reached version 1.0 of the Paleo-Future blog. If you'd like to check out the latest posts please visit: http://www.paleofuture.com. Thanks.